Harvesting, or picking raspberries may leave us with a few scratches from the tiny thorns, but all is forgiven when the delicious berries are sampled fresh, or used in a fabulous raspberry recipe, taking our taste buds on an amazing trip! 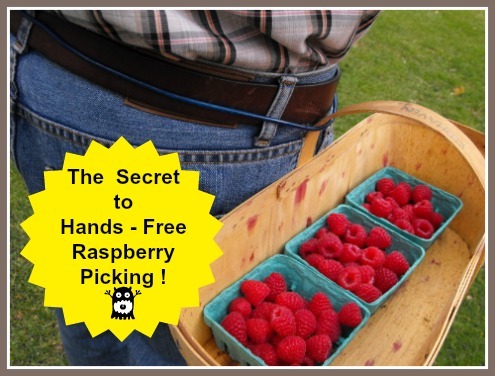 Check out the tips below to make your raspberry picking experience quick and easy - and use two hands! Exactly what time of the growing season, and for how long, raspberry plants bear fruit depends largely on the variety (cultivar) of raspberry. 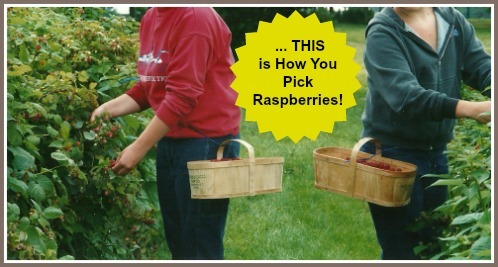 Hands Free Raspberry Picking is the Key! Generally, there are summer bearing and fall bearing varieties of raspberries. The harvest (for red raspberries), perhaps the most common type of berry grown by the home gardener, is usually for about a 1 - 2 week period with a "peak" period in between. It is advisable to check your patch for ripe raspberries every day, or every other day during the raspberry harvest season. The raspberries mature at different rates, so you will want to go through the patch and pick only the ripe ones. 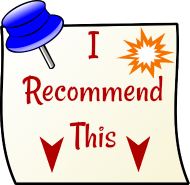 If you have applied chemicals to your raspberry plants because of pests or disease, refrain from picking raspberries until the required number of days specified on the product instructions. Choose raspberries that are plump, firm and fully ripe. Do not pick raspberries which have not fully ripened. Unlike some fruit, raspberries do not continue to ripen after they are picked. A fully ripe raspberry will gently fall into your hand when you pull on it slightly, without effort. When picked, raspberry fruit detaches from the receptacle, so the fruit will have a "cupped" shaped cavity at its centre. If you need to tug at the berry, it is not ready to be picked! Any over-ripe raspberries that were missed previously, should be removed from the bushes, and discarded. Leaving them on the raspberry bushes to decay, will attract garden pest, for example Japanese Beetles. These pests will move into the fresh, just ripened berries once they have been attracted to the raspberry patch because of overripe berries. The best time of the day to pick raspberries is in the morning or on a cool, cloudy day, when the sun has not made them too hot, so they will not get mushy as you put them into your containers. Some sources claim that picking raspberries at this time also means that the flavour will be optimal. THIS is the Best and Fastest Way to Pick Raspberries! You really need both hands to pick raspberries. We find that the best way to do this is to use a piece of rope or clothesline, and a basket tied around the waist. We use the basket to hold three pints (or other containers), and that way we have two hands "free" to pick! Avoid leaving the freshly harvested berries in the sunshine longer than is necessary. you have picked in the shade of a tree or other available shade. If you are bothered by the tiny thorns on raspberry bushes wear thin gloves with the "fingers" cut off. If it is very warm outside when you picked the raspberries, allow them to stand on the kitchen counter at room temperature before storing them in the refrigerator. Refrigerated raspberries will stay good for about 3 days. Do not wash the raspberries until just before you are ready to eat them or use them in a recipe. This will help to prevent the fruit from absorbing water, diluting the flavour, and will help to prevent them from becoming "mushy". If you plan to freeze, can (preserve) or dry (dehydrate) your raspberries, it is best to do this the same day you pick them. 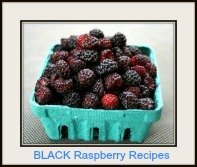 This will provide the best nutrition and flavour of the berries when thawed. After you've picked all those raspberries, what are you going to do with the ones you can't eat before they start to "go bad"? You can freeze them, can them, or dry them! Raspberries are nutritious, providing many essential vitamins and nutrients and fibre. They are also high in antioxidants, which of course are the micro-nutrients that are linked to cancer prevention. Eating fresh picked raspberries will provide the best taste and nutrition. 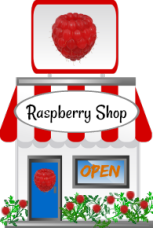 Fresh picked raspberries are scrumptious in raspberry pies, cakes cookies, muffns, pancakes, dessert and much more! 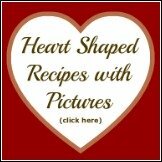 It is becoming increasingly popular to include fresh raspberries in salads too! Check out the above link for the MOST COLOURFUL SALADS EVER! Granted, it is somewhat time consuming picking raspberries, because of the tiny size of the fruit, but, what other plants bear such amazing fruit, and asks for so little care in return! If you do not grow your own raspberries, you may want to take advantage of picking raspberries at a "Pick your Own" Raspberry Farm in your area. For more detailed information about growing raspberry plants, here follow links (or use the navigation bars) to pages which will be helpful in your berry growing endeavours!